Assigned to Capt Nicholas Megura The crew chief Sgt Fox added 15 black and white German crosses beneath the cockpit marking Capt Megura's impressive combat record before he was shot down in another aircraft on 22nd May 1944. Not all of Megura's fighter kills were scored while flying in this aircraft but it was his regular mount. In just two months, Capt Megura knocked down four Me109s, five Fw190s and two Me110s in aerial combat and destroyed 2 Ju52s on the ground as well as sharing several other victories with other pilots in the air and on the ground. 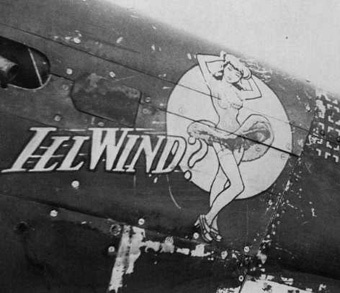 "Ill Wind" was lost 20 miles southwest of St Dizier on 9th May 1944 while being flown by 1Lt Vernon Burroughs (POW). Capt Megura was shot down a few days later on 22nd May and belly landed in aircraft onto Kalmar airfield in Sweden. While tangling with three Me109s his Mustang had been shot up by an American P-38 Lightning in the dogfight.